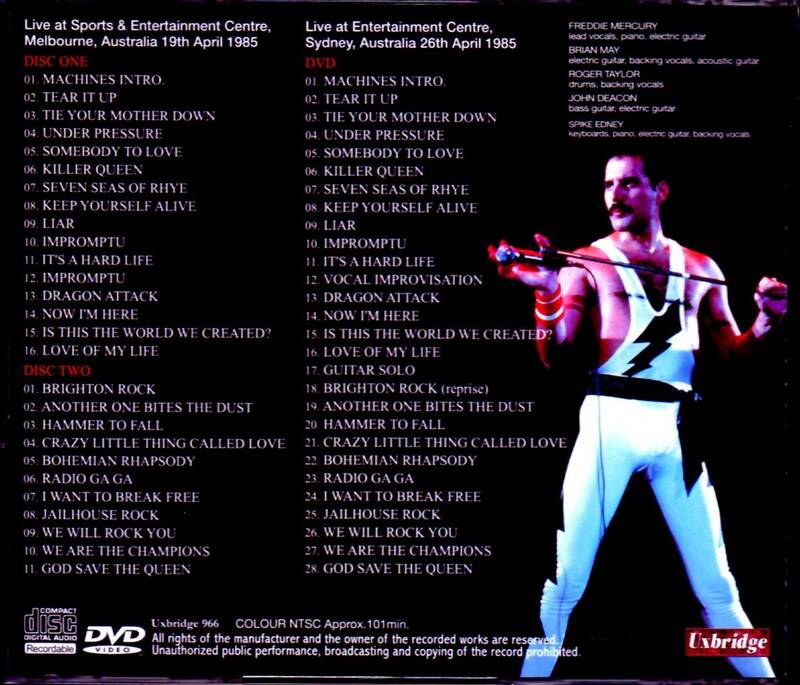 Recorded: Sports & Entertainment Centre, Melbourne, Australia 19th April 1985. DVDR: Live at Entertainment Centre, Sydney, Australia 26th April 1985. Comments: From 'The Works' Australia & New Zealand tour in 1985. Roots: From audience tape recording. So far this Melbourne gig is the only one who has been bootlegged on cd's. It has previously been released on at least 2-3 bootleg cd's. I'm not sure of sound quality on this one, but info I have found say's excellent sound. The Sydney film has also been out on dvd's before. The dvdr is a one camera audience film. The last Australian tour of QUEEN realized that LIVE AID and just before the last visit to Japan. The decision board collection which coupled the masterpiece work appears. Two performances are contained in this work. It is a set of three sets which set the full audience recording of "1984 April 19 Melbourne performances" and the "superb audience shot of" April 26 Sydney performance ". First Australia of QUEEN was THE SUNBURY POP FESTIVAL in January 1974, but only two tours were conducted in 1976 and 1985. "MAGIC TOUR" in 1986 was limited to Europe, so in other countries "THE WORKS TOUR" was the last. First of all, let's check out the position of the show from the outline of such a world tour. "February 27" THE WORKS "release"
This is the whole picture of "THE WORKS TOUR" which was the last as a "world" tour. This work corresponds to the fourth performance of such "Oceania" leg and the seventh performance eyes. Let's introduce it for each performance. First of all, the superb audience recording of "April 19 Melbourne" appears. Recording was known long ago, a classic that has been loved as 'No.1 recording of Oceania in 1985'. Many previous episodes have been born, but this work shines at its highest among them. The most famous one is Killing Floor label "MELBOURNE 1985", but this work sounds different from other sounds clearly. Based on the era of the Louis Jane Master discovered in 2007, it is an industry that has been polished further by meticulous mastering. Anyway, the youthfulness of Genes is overwhelming. The sense of air is clearly clear, both the performance and the singing voice reaching straight are super beautiful. Besides being simply beautiful, the core is firmly on and clear every corner of fine detail. Even this alone was a different thing from the Killing Floor board, but this work raises the possibility to the maximum. The stereo feeling which was oddly earlier was also shifted to the right on the whole was also arranged, and each range is also organized. Especially upgrading to the extent that I think that Nuke of the bass and response are "really the same recording!?" It also supplements the tape change (about 30 seconds) of "Is This The World We Created?" Which was regarded as the biggest drawback of name recording. 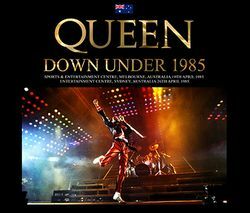 It was the Sydney performance on Disk 3 that was used, but in Oceania in 1985 there are only two of these best records. The connection is also natural, so that traditional name recordings can be enjoyed in a seamless complete form while updating the highest quality. Following such a superb live album is also the finest audience shot. It is a historic masterpiece image that blew the world as "WELCOME TO THE MACHINE". The appearance of this video was also an incident. It is a master unearthed in 2009 ten years ago, but its quality is unusual. First of all it is a vision. It seems to have been taken from the stand on the right side of the stage (John Deacon side), but the shadows of the front row do not enter at all, only the stage occupies visibility with zero obstruction. Although it is a stand seat, it is also good not to look down. The line of sight is just as high as Freddie on the stage, and it is easy to see that the line of sight is likely to match despite the oblique angle. Furthermore the sense of stability is amazing. Obviously I use a tripod, there is no camera shake. Even if the photographer of this work approaches gui guitar and zoom, it does not shake thoroughly. Normally, if you chase a member running around while zooming it will be surprising, but this work continues to capture the highlights while keeping it brisk. As a result, despite the shooting of the seats in the seats, the field of vision changes to corners and it does not become monotonous. Master freshness that could have kept such brilliant shooting until the present age is shocking. Anyhow glossy and beautiful. Although it is an analog feeling only in the video camera popularization period, no dubbing marks can be seen in that detail or coloring. The image beauty continues undisturbed, thinking that it was digitized directly from the Omoto master. The freshness is also felt from the sound, glossy delicate sound covers the whole story. As a matter of fact, at the beginning of 'It's A Hard Life' guitar solo and 'Another One Bites The Dust', intro of 'I Want To Break Free' and 'We Will Rock You' However, such parts also cover speech as much as possible. The process to connect smoothly is given. Speaking of 1985, it is still a dawn of the audience shot. If you are surprised that you were able to shoot such a picture in such a time, it is overtaken by the fact that it kept the original quality. It was also a shocking picture of being criticized as "the highest peak of the 80s audience" at that time. And the two performances drawn with such superb quality are superb. As internal circumstances was QUEEN who was suffering from fullness, but when he staged on the stage, he was engaged in an entertainment that excludes adversity. Freddy's singing voice is truly powerful, grim and beautiful. Although it is a set which is also familiar to the Japanese performance just after this, "Dragon Attack" which was cut by that video work "WE ARE THE CHAMPIONS: FINAL LIVE IN JAPAN" and Brian's guitar solos are also firmly seen. It is also the point that Freddie is singing all the melodies without leaving it to the audience in "Love Of My Life". In Melbourne performance (Disc 1-2), Freddie sang "Under Pressure" as soon as 1 chorus, and in Sydney performance (Disc 3) it mistakes with "Death On Two Legs" that struck before "Killer Queen" The scene that somehow misleads is also funny. Especially in the Sydney performance with video, you can also enjoy the action of crispy. "Hammer To Fall" throws a paper cup while calling the name of the song, but catches it perfectly matching the intro of the song. It is cool to decide such casual scenes. Queen of 1985 that went on to the last Japanese performance, and to LIVE AID. It is a 3 - tuple that "Couples the Last Oceania" which is just before it with the No. 1 live album with the 80 's best shot. One set is a preliminary set of the press class. Please, enjoy it as much as you want.